south island, part 2 — ...and we're off! our time in the southwest part of south island ended up being three of the best days of our road trip because fiordland national park is just too spectacular for its own good. the largest of new zealand’s fourteen national parks, fiordland is home to some beautiful trails and a wide range of flora and fauna – many of which are completely unique to the area. our new friends gary and susan highly recommended we check out mount luxmore and the kepler track. who knew that the last day of january would be the first time we’d summit a mountain? the challenge promised sweeping views of the te anau basin, and with the skies clear and the sun shining we couldn’t wait to get started. enjoying a short break at brod bay. our 20-mile roundtrip hike began with an easy walk near the lakeshore through a thick forest of mountain, red beech, rimu, and miro trees. with every step, it felt like we were heading deeper and deeper into middle-earth. the magical world tolkien had created was coming to life all around us! after passing through a verdant grove of hard tree and crown ferns and crossing a little bridge, we reached beautiful brod bay and stopped to take in the views. at this point the trail began to climb and didn’t stop for a few hours. but we were too busy enjoying our surroundings to be bothered by the ascent. tall trees rose up to meet us in every direction as the path wove its way up the mountainside. beams of sunlight streaming through the canopy made our vivid green world glow even brighter. breathtaking views kept us going the whole way. we eventually reached the sheer limestone bluffs and took a short break. after another hour or so of hiking, we reached the bush line and stepped out into the arms of the warm sun. it’s funny how abruptly the trees ended there, as if they'd made a pact to stay put. with their trunks and branches out of the way and no one around us, we were suddenly aware of the panoramic views we had to ourselves. the te anau basin, the takitimu mountains, and the snowdon and earl mountains were laid out before us in all of their splendor. we arrived at luxmore hut just in time for a quick lunch of peanut butter and banana sandwiches. those who do the entire kepler track (3-4 days) usually spend the first night here, which is less of a hut and more of a large, well-kept cabin. this was originally where we’d planned to turn around because alex was afraid that if we tried to summit, it’d be too late to make it back down before sunset. i, on the other hand, had more faith in our tramping abilities, and we’d actually made it to the hut in less than half the estimated time. hooray! so, after twenty more minutes of relaxing we left our sunny spot on the deck and resumed our journey. up, up, up we hiked, past small mirrors of water and golden grass until the top of mount luxmore loomed directly above us. this was the most unnerving part of the trail – you have to tread carefully on gravelly rock right on the mountain’s edge. there were no guardrails to keep us from slipping and sliding a long way down to a very unhappy place. i found this exciting, but being on the edge made alex very on edge. thankfully we made it past this section alive and suddenly found ourselves at the foot of the summit. after a bit of scrambling up some loose rock, we were standing on top of our first mountain at 4,829 feet! looking down, it was hard to believe we’d started all the way at the bottom, just above sea level. the views were incredible, and we were very proud we’d made it. we spent an hour there relaxing and enjoying the scenery, then reluctantly started on our long descent. ten grueling miles later, we were finally back at the start of the trail and totally exhausted. this was by far the longest and most challenging hike we’d done to date, and our bodies were definitely feeling it. but despite complaints from our cramped legs, our eyes were thankful for the breathtaking sights we’d witnessed that day. the incredible milford sound on a rare sunny morning. the next morning we woke up early and got ready for our next adventure – a boat ride through milford sound. as we drove along the very scenic milford road, we watched the mountains grow steeper and the greens, grays, and blues intensify around us. it was a beautiful, winding two-hour drive, and our morning was off to a great start. but it was about to get even better. 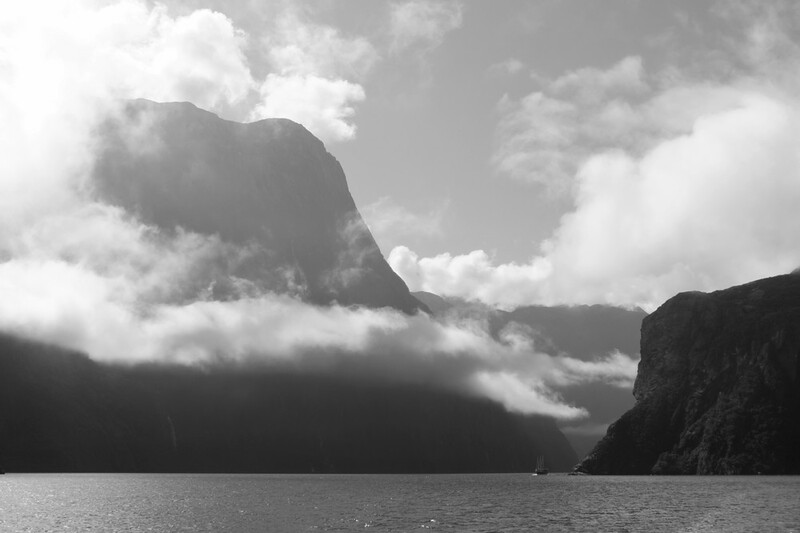 as we’d heard all along, milford sound truly is a spectacular natural wonder. we were lucky enough to experience its beauty on a sunny day, especially since this is one of the wettest places in the world where the mean annual rainfall is a whopping 182 inches! milford sound is also actually a fjord, not a sound – the difference being that a fjord is carved by a glacier and not a river. the fact that it was created by glaciers hopefully paints a picture of how impressive and awe-inspiring this place is. but i’ll let our pictures do most of the talking. suffice it to say that we loved cruising alongside the green mountains and sharp cliffs decorated with rolling fog. the roaring waterfalls were also incredible, especially since we got close enough for a “glacial facial!” and i definitely got a kick out of the adorable fur seals sunning themselves on the rocks (who wouldn't?). freedom camping definitely comes with great surprises. we spent the rest of the day enjoying the pretty drive to lake wakatipu, new zealand’s longest lake. the color of the water was gorgeous – a sort of milky turquoise blue – but it hadn’t always been that way. apparently there’d been a huge landslip a week or two before we arrived, and all of the fallen glacial rock sediment had changed the lake’s color in the best way possible. it was quite mesmerizing! as the sun was setting we settled into drift bay on the southern edge of the lake. it was the perfect place to camp for the night – right on the beach and with a tiny teepee to boot! to complete the ambiance, wispy clouds curled over the peaks around us and glowed with just a hint of sunlight. i think this will always be one of our most memorable camping spots. a peek at what life on milford road is like.